Offered for sale with NO ONWARD CHAIN and situated in a tucked away location, is this 3 bedroom semi detached family home. The property benefits from a good size plot with level front, and South Westerly rear facing garden. This gas centrally heated and uPVC double glazed property comprises, on the ground floor: dual aspect living room, triple aspect kitchen/breakfast room, downstairs WC. On the first floor are 3 bedrooms and bathroom. 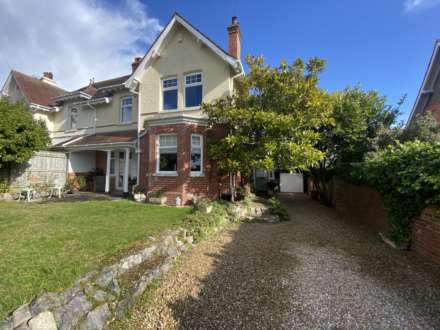 Situated within walking distance of the school, town centre and sea front, an appointment to view is strongly advised. A bright and airy dual aspect room with double glazed window to front aspect and double glazed patio doors to the rear. Fireplace and surround. Central heating radiator. Television point. Telephone point. A triple aspect room with double glazed windows to front, side and rear aspect. This modern stylish kitchen is fitted with a matching range of floor and wall mounted cupboard and drawer units, with work surfaces over. Ceramic single drainer sink unit with mixer tap over. Complimentary floor and wall tiling. Space for cooker and further appliances. Wall mounted gas boiler. Electric meter box. Central heating radiator. Spotlights to ceiling. Space for table and chairs. Double glazed door to rear garden. Double glazed window to rear. Wall mounted wash hand basin. Low level WC. Double glazed window to rear aspect. Doors to bedrooms and bathroom. A dual aspect room with double glazed window to front and side aspect. Built in cupboard to alcove. Former airing cupboard built in over stairwell with shelving. Central heating radiator. Picture rail. Access to bedroom 3. Double glazed window to rear aspect. Fitted storage unit. Central heating radiator. Telephone point. Obscure double glazed window to rear. White suite comprising: panelled bath with electric shower over, shower rail and curtain. Wall mounted wash hand basin. Low level WC. Heated ladder rail. Complimentary wall tiling. Extractor fan. The house is situated in a tucked away location on a generous size plot. To the front of the property there is a large garden which is laid to lawn, with a pathway leading down the side of the property to the rear garden. Outside tap. Gate to garden. To the rear of this property is a very large and level rear garden that MUST be viewed to be fully appreciated. The garden is laid to an extensive lawn that has some mature shrubs and trees, that all help to provide all year round colour and interest. Timber shed and summerhouse. Mains gas, electric, water, drainage and telephone, although we have not verified connection. Council tax band C.
From our prominent Exmouth Town Centre office, proceed out of town along Salterton Road. After passing the re-cycling centre, turn right at the mini roundabout. Take the next left into Knowle. After passing the Village Hall on your right, take the next turning right into Bedlands Lane and continue along this road until you reach the school at the end. This is Barn Lane. There is a pedestrian footpath part way along this road on the left hand side. Walk along this path and number 7 will be found half way up on the left hand side clearly identified by our `For sale` board.